Glider Heaven: 2 Love Seat Gliders, 6 Big Boy Adirondack Chair Gliders around a fire pit. Standard Deck Chairs and Deck Table, stained with Messmer`s UV-Plus Natural. Custom-built Fire Pit Table surrounded by gliders. Love Seat Glider stained with Messmer`s UV-Plus Natural. Standard Adirondack Chair, unstained, with optional carvings. Adirondack Love Seat, unstained. The seat measures 44 inches wide. Standard Deck Chair and Deck Table, stained with Messmer`s UV-Plus Natural. 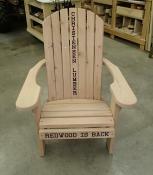 Personalized wedding present: redwood loveseat glider with a cup holder in each arm. California redwood, like Western Red Cedar, is resistant to decay, rot and insects. 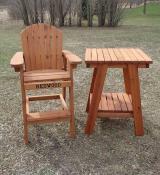 The rich luxury of redwood furniture will add value to any home, cabin, deck or patio. The redwood we use is 1 3/8" thick, so our chairs are synonymous with heavy duty. A Standard Redwood Adirondack Chair weighs about 40 pounds -- heavier than cedar, but lighter than polywood. Standard Redwood Adirondack Chair (20-inch wide seat), unstained: $235. Stained: $275. Big Boy Redwood Adirondack Chair (23-inch wide seat), unstained: $245. Stained: $285. Adirondack Love Seat (44 inches wide), unstained: $360. Stained: $420. Standard Garden Chair (20-inch wide seat), unstained: $225. Stained: $265. Big Boy Garden Chair (23-inch wide seat), unstained: $235. Stained: $275. Angle Table, unstained: $185. Stained: $221. Fancy Side Table, unstained: $160. Stained: $191. 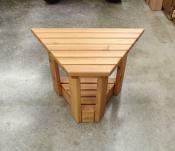 Fire Pit Table: Call or e-mail for a quote on a custom-built table that will fit your fire pit. Standard Deck Chair (20-inch wide seat), unstained: $260. Stained: $305. Big Boy Deck Chair (23-inch wide seat), unstained: $280. Stained: $325. Deck Table, 25" x 28", same height as Deck Chair arms, unstained: $220. Stained: $261. 20" Square End Table, same height as Adirondack Chair arms, unstained: $95. Stained: $115. Standard Adirondack Glider (20-inch wide seat), unstained: $325. Stained: $376. Big Boy Adirondack Glider (23-inch wide seat), unstained: $335. Stained: $386. Adirondack Love Seat Glider (44-inch wide seat), unstained: $450. Stained: $521. Standard Garden Glider (20-inch wide seat), unstained: $315. Stained: $351. Big Boy Garden Glider (23-inch wide seat), unstained: $335. Stained: $361. Garden Love Seat Glider (44-inch wide seat), unstained: $460. Stained: $531. Footrest unstained: $50. Stained: $60. Glider/Rocker Footrest unstained: $85. Stained: $95. Our cup and wine glass holders can go on either or both arms. They're only $5 each.